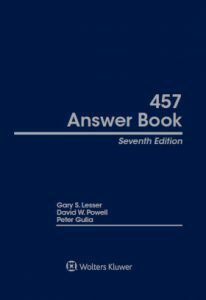 The most recent update to the Seventh Edition of the 457 Answer Book was published on July 20, 2018. Carol V. Calhoun is the author of Chapter 1, History of 457 Plans, and Chapter 14, Miscellaneous Issues. The 457 Answer Book is an in-depth resource that provides answers to the questions that tax-exempt organizations, state and local governments, their accountants, tax and legal advisors, 457 administrators, product providers, and investment counselors need to know. Guiding readers through all aspects of 457 plan administration — from installation through the audit process — the 457 Answer Book describes: the duties and responsibilities of those performing the functions; the required legal, accounting, and administrative tasks; checklists that facilitate control of each administrative process; and suggested forms. More information on the book can be found at this link.